Toronto Star, February 2, 1912. Posted above is the earliest front page story regarding Groundhog Day published by either the Globe or the Star. On that day’s editorial page, the Star published a piece about the occasion by syndicated poet Walt Mason (1862-1939). Toronto Star, February 7, 1908. Here’s the earliest story from the Star about Groundhog Day, though it’s less about the day, more about farmers from southwest Ontario petitioning the provincial legislature for the right to shoot the critters. The Canadian Encyclopedia has a lengthier look at the day’s origins, and its history in Canada. Originally published on Torontoist on October 13, 2011. Gooderham Building, 1996. Photo by Boris Spremo. Toronto Star Photo Archive, Toronto Public Library. An iconic image of Toronto: a photograph looking west from the intersection of Church, Front, and Wellington Streets, with the Gooderham Building (a.k.a. the Flatiron) as the focal point. The unusual skinny, triangular shape, which predated New York’s flatiron by a decade, was the result of the clash between Wellington Street’s adherence to Toronto’s square grid and Front Street’s looser paralleling of the 19th century shoreline. In the 120 years since George Gooderham first surveyed his business empire from his fifth floor office, the building that bears his family’s name has evolved into a Toronto landmark. Coffin Block, Front and Wellington Streets, 1873. City of Toronto Archives, Fonds 1244, Item 7335. Before the Gooderham Building was erected in 1891, another flatiron-shaped structure occupied the block. Consisting of three connected units, the structure was known as the Coffin Block due to its resemblance to the end of a funeral box. Among its tenants were a telegraph office, a stagecoach booking office, and additional guest rooms for the Wellington Hotel, whose main premises were located on the northwest corner of Church and Wellington. Whoever archived this image determined that notes written on the side of the photo weren’t enough for future researchers. Gooderham Building, circa 1893. Toronto Illustrated 1893 (Toronto: Consolidated Printing, 1893). Here’s a wealthy person the Occupy Wall Street movement might respect: when George Gooderham died in May 1905, he purposely left most of his fortune in the hands of the Ontario government. He decided against selling any of his stocks to anyone else due to his belief that it was unconscionable to evade provincial succession duties. The portion of Gooderham’s $25 million estate that the government received wiped out the provincial deficit. Though Gooderham’s fortune was based on the Gooderham and Worts distillery, he built it through investments in banking, insurance, and railways. He was among the founders of Manufacturer’s Life (now Manulife), served as president of the Bank of Toronto (an ancestor of TD Canada Trust), and backed the construction of the King Edward Hotel. His philanthropic interests included key financial and managerial roles at Toronto General Hospital and the University of Toronto. Gooderham Building, 1890s. Photo by F.W. Micklethwaite. Library and Archives Canada, RD-000335, via Wikimedia Commons. Architect David Roberts Jr. was no stranger to the Gooderham family when he was chosen to design the new building. Among his other commissions was Waveney, George Gooderham’s mansion at Bloor Street and St, George Street, which currently houses the York Club. To replace the demolished Coffin Block, Roberts designed a five-storey red brick office building trimmed with Credit Valley stone. Gooderham’s personal office was located at the top of the semi-circular tower in the front, where he could view of many of his business interests. Also included for Gooderham’s benefit was a tunnel under Wellington Street to the head office of the Bank of Toronto (now the site of Pizza Pizza). Gooderham Building, between 1966 and 1972. Photo by Ellis Wiley. City of Toronto Archives, Fonds 124, File 2, Item 65. Gooderham and Worts maintained offices in the building through the early 1950s. By the 1960s, despite its growing status as a local landmark, its future seemed in doubt. As plans evolved for a Centennial-related series of arts complexes in the neighbourhood, the buildings that occupied the rest of the Gooderham’s little island were razed for a temporary parking lot. By 1966, the orphaned building was the temporary headquarters for the St. Lawrence Centre for the Arts rising to the west. As the 1960s, the Gooderham provided office space for arts organizations like the Mendelssohn Choir, the Shaw Festival, and the Folk Arts Council. Globe and Mail, September 19, 1973. But the Gooderham Building managed to survive in an era when one aging downtown building after another fell to the wrecking ball. New ownership in the mid-1970s poured money into renovations. Instead of building arts schools or small concert halls beside it, the City of Toronto approved the public space that officially opened as Berczy Park in 1975. That same year, the Gooderham Building was declared a historic site. Two attempts were made to dress up the west wall, which had actually belonged to a long-gone neighbouring building. A mural of clouds painted by Daniel Solomon during the early 1970s was eventually covered over—allegedly the wall was too poorly prepared to handle the piece. Attempt number two began with a suggestion from the city’s heritage agencies that any future artwork should incorporate the architectural stylings of the surrounding 19th century buildings. A combination of commercial donors and funds from the Wintario lottery provided artist Derek Besant with $80,000 to come up with a durable piece of art. The result: 49 panels of a polyethelene-based construction material called Alucobond that formed a trompe l’oeil special effect of a wall curling at its edges. Berczy Park looking east at the Gooderham Building, before and after landscaping. City of Toronto Archives, Fonds 200, Series 1465, File 623, Item 5. When Besant’s piece was unveiled on September 19, 1980, the Globe and Mail’s John Bentley Mays called it “an engineering masterpiece and an artistic triumph that will be flying high on the Flatiron Building for years.” Two restorations later, the piece is as much a Toronto landmark as the building itself. The building’s landmark status has grown with time. As larger office towers filled the skyline to the west, it has provided photographers with an interesting contrast of past versus present. The site has consistently been one of the most popular attractions during Doors Open. Any new owner would risk a public outcry if they messed with the flatiron shape or the well-restored building’s other unique attributes. The building was purchased by Commercial Realty Group. Editorial on what would become Berczy Park, Toronto Star, August 8, 1972. Globe and Mail, September 19, 1980. Originally published as a “Historicist” column on Torontoist on December 26, 2009. The original artwork has been replaced with public domain illustrations from late 19th century books found at Old Book Illustrations. “Stealing.” Illustration by Louis Rhead. The life and death of Mr. Badman by John Bunyan (New York: R.H. Russell, 1900). Old Book Illustrations. Crime knows no vacation. While many of us look to the holiday season for peace and good cheer, others find themselves on the wrong side of the law. For as long as inebriates have been hauled in for disturbing the peace or thieves have secured deeper-than-advertised discounts on Boxing Day specials, the police blotter has rarely rested during the closing weeks of the year. While the most sensational crimes garner headlines today, a century ago most of Toronto’s six battling daily newspapers published lengthy accounts of court proceedings no matter how small or unusual the charge. Fined a dollar for failing to secure your horse? Clumsy cab driving? Swearing in public? All of these misdemeanours earned you fifteen seconds of press infamy in 1909. But we’re not interested in petty offenders. Give us illegal partridges, turkey liberationists, and cannibalistic ruffians. A Christie Street citizen, whose name the police refuse to disclose, ate too much turkey and pudding on Christmas Day, and for half an hour after midnight he was found, clad only in his nightie, running along Van Horn Street [now Dupont Street], shouting for Shrubb to come and race him. He was in a dream or trance or something of that sort, and ran all the way from Christie Street along Van Horn to Dovercourt Road before his cries attracted the attention of Acting Detective Mahony. The officer at first thought he was crazy, but when the man was wakened he seemed rational enough and thoroughly ashamed of himself. Mahony helped him to secure some much needed clothing and then the citizen went home. He’ll dine more wisely next Christmas. Judge: Did you walk on the lawn? Judge: Was there a sidewalk? Judge (after brief conversation with Atwell’s lawyer): Non-suit, without costs. Drawing of a wild turkey by an unknown artist. Bilder-atlas zur Wissenschaftlich-populären Naturgeschichte der Vögel in ihren sämmtlichen Hauptformen by Leopold Joseph Franz Johann Fitzinger (Vienna: K.K. Hof- und Staatsdruckerei, 1864). Old Book Illustrations. Turkee Gobler, poor old chap, was condemned to hang on December 24, the place of execution being W.J. Nichol’s store at 252 Queen Street East. His heart burning with pity, Robert Bastine, of 108 Oak Street, swore to affect a rescue. As the shades of sunset crept over the street, he emerged from his hiding place, and while the careless crowd passed the scene of execution, stealthily advanced to the rescue. With a fell swoop he cut the halter and as Gobler came to earth, deftly caught him in his arms and bore him off. But the doughty knight lived not happily ever afterward, for the law cast him into a dungeon, and charged him with theft. This act of holiday terrorism earned Bastine three days in the slammer. When McDonald told Donaghue to go home and behave himself, the officer received a steady stream of obscenities. As the Star put it in more genteel terms, “Donaghue became indignant and owing to the befuddled condition of his brain didn’t use proper discretion in his selection of language.” Result: an arrest for disorderly conduct. By now, a crowd had gathered to witness the mounting tension between the two men, which exploded into a fight after Police Constable Joseph Baird arrived at the scene and Donaghue launched into another cursing fit. Witnesses were unable to determine who struck the first blow—the Mail and Empire claimed Donaghue kicked McDonald in the thigh, while the Star claimed that the officer hit his prisoner in the mouth and bloodied his nose while Baird repeatedly hit the prisoner’s arm with his baton. Donaghue asked for help from the crowd, which arrived in the form of “little fellow” Herbert “Red” Evans, who promptly slugged Baird in the jaw. In the midst of this new development, Donaghue sank his teeth into McDonald’s wrist, which caused the officer to later seek medical attention. Donaghue and Evans, both described as having poor reputations in the neighbourhood, were hauled into court the following morning. According to one lawyer, “I don’t know why he should want to eat one of our new patrol sergeants. He’s been here before for this kind of thing.” Described by the Telegram’s court reporter as “the man with the cannibal appetite,” Donaghue received six months hard labour for his snack, while Evans’ father paid a ten-dollar fine for his son’s actions. “Cheap Wine.” Illustration by George Du Maurier. Trilby by George Du Maurier (New York: Harper & Row, 1895). Old Book Illustrations. Additional material from the December 23, 1909 and December 28, 1909 editions of the Mail and Empire; the December 24, 1909 and December 27, 1909 editions of the News; the December 23, 1909, December 24, 1909, and December 27, 1909 editions of the Toronto Star; and the December 23, 1909 and December 24, 1909 editions of the Telegram. This is an expanded version of an article which first appeared as The Grid’s “Ghost City” column on November 20, 2012. Rosedale Field clubhouse, November 30, 1921. City of Toronto Archives, Fonds 1231, Item 615. Chambers forgot Rosedale Park’s key role in Canadian football history. This might be understandable, as the Grey Cup’s debut there on December 4, 1909 was an anti-climatic affair. Fans and media expended their energy during the semi-final at the park the previous week, when the heavily-favoured Ottawa Rough Riders were trounced by the University of Toronto Varsity Blues 31-7 in front of a crowd of 11,000 spectators forced to sit 15 deep around the field. Among those playing for U of T were future Ontario chief coroner Smirle Lawson and future Ontario Rugby Union head Billy Foulds. Toronto Star, December 6, 1909. Toronto World, December 5, 1909. There wasn’t even a trophy to hand to the victors; it took a series of frustrated letters from football officials to Grey’s staff to produce the $48 bowl made by Birks jewellers handed to the champs three months later. The News, December 6, 1909. Rosedale Park’s association with athletics stretches back to May 24, 1892, when it officially opened as the Rosedale Lacrosse Grounds. “It is safe to say that the majority of those who attended the grounds yesterday for the first time expected to confront a bare open area, with a grandstand and high board fence as necessary adjuncts,” the Mail reported. “What they did see was a revelation. Five acres of beautifully levelled and sodded ground, broken only by an oval track of a third mile in circumference, by a picturesque club building, and by low division fences, was the scene immediately facing them.” The grandstand held 3,000 spectators, while another 2,000 people filled the grounds to watch Toronto fall to Montreal three games to two in the day’s lacrosse action. Rosedale Park, July 1, 1921. City of Toronto Archives, Fonds 200, Series 372, Subseries 52, Item 947. The site was purchased by the city from the Toronto Lacrosse and Athletic Association in 1917. Following the First World War it considered as a site for a new municipal stadium, but the location was considered too isolated. Arguments over the site’s suitability led to tons of wasted newsprint on the editorial pages of the Star and the Telegram. The grandstand disappeared, leaving more space for sports like cricket, high school football, ice hockey, lawn bowling, and tennis. A few athletic organizations, like the Toronto Track and Field Club, wore out their welcome with neighbours and city parks officials. Despite being denied a permit to continue practicing running and pole jumping on the grounds in 1951, the “Red Devils” continued to use Rosedale Park. Living up to their nickname by hurling “ungentlemanly remarks” at park staff and hanging around the fieldhouse after closing time didn’t help the group’s appeals to Parks and Recreation. After arrangements were made to move the club to Varsity Stadium, the pole vaulting pit was quickly filled in lest they return. Most complaints about the park during the 1940s and 1950s were directed at the aging fieldhouse. Clubs battled for precious dressing room space—by 1950, women had to use a small lobby to change after a cricket club took over their quarters. The city rejected a request from the Highland Tennis Club to build an addition from fear other users would request their own extensions. Neighbours complained about smoke from the coal-fired building due to a lower-grade rock introduced during World War II continued to be used. The building was eventually replaced by the current clubhouse, which includes changing facilities and offices for the Rosedale Tennis Club. One of the most tragic events in Rosedale Park’s sporting history occurred on October 25, 1960. During a football game against Jarvis Collegiate, North Toronto Collegiate halfback John Ellwood received a hard hit to the head. After continuing for two more plays, he left the field complaining of a headache. When his coach told Ellwood to tilt his head back, he slumped forward with a brain hemorrhage. Five hours of surgery followed at Wellesley Hospital, but Ellwood never regained consciousness, remaining in a coma until his death in 1972. The park remains a central part of North Rosedale’s leisure time. For decades it has hosted the Mayfair community celebration. Twenty-first century upgrades include new playground equipment and a revamped historical plaque honouring the first Grey Cup. If he had been on hand for the plaque’s unveiling, Charles Chambers would have eaten his words about the park’s lack of history. Additional material from the October 20, 1959 and January 1, 1963 editions of the Globe and Mail; the May 25, 1892 edition of the Toronto Daily Mail; the December 6, 1909 edition of the Toronto Star; and the December 5, 1909 of the Toronto World. Originally published on Torontoist on July 3, 2012. For its mid-1980s advertising campaign, the King Eddy highlighted its roster of esteemed guests. Whether Rudyard Kipling actually played with the title of one of his works to describe his stay is debatable, but he certainly received royal treatment elsewhere while visiting Toronto as part of a Canadian speaking tour in October 1907. The British author began October 18, 1907 with an automobile tour of the city. Over three “most enjoyable” hours, Kipling wound through Rosedale, greeted students and faculty at Upper Canada College and the University of Toronto, and stopped at City Hall. Legend has it that he was supposed to make an appearance at the Woodbridge Fair, but cancelled at the last minute. Though there is no evident proof, it is suspected that the rural road running into Woodbridge was renamed Kipling Avenue soon after, despite his being a no-show. Sketches by C.W. Jefferys, Toronto Star, October 19, 1907. Additional material from Toronto Street Names by Leonard Wise and Allan Gould (Toronto: Firefly, 2000), the October 19, 1907 edition of the Globe, and the October 19, 1907 edition of the Toronto Star. The Globe, October 19, 1907. Originally published as a “Historicist” column on Torontoist on September 20, 2008. This is one of the first examples of Historicist columns I’d write in a hurry if the topic I was working on fell apart or required more research before deadline. Queen Street West and James Street, looking northeast. William James Sr., 1908. Wikimedia Commons. One of the easiest way to grab a snapshot of Toronto’s past is to find the nearest microfilm reader (or online archive) and browse any of the newspapers that have chronicled the daily adventures of the city. For a taste of what was going on a century ago this weekend, we dive into the pages of one of Toronto’s long-defunct morning papers. The Toronto World was launched in August 1880 by reporters William Findlay Maclean and Albert Horton to support a Liberal candidate in a by-election. Maclean (1854–1929, pictured on the right) bought out Horton a year later and ran the paper as a populist daily, specializing in exposing civic corruption. Among the causes the paper successfully backed were Sunday streetcar service and municipal ownership of the hydro utility. The World served as a training ground for influential editors like Joseph Atkinson (Toronto Star) and Hector Charlesworth (Saturday Night). Maclean served as a local MP from 1892 to 1926, sitting as a Conservative or “independent Conservative” depending on how well his maverick nature meshed with party brass—usually it didn’t. Perennially on the brink of bankruptcy, Maclean sold the paper to the Mail and Empire in 1921. 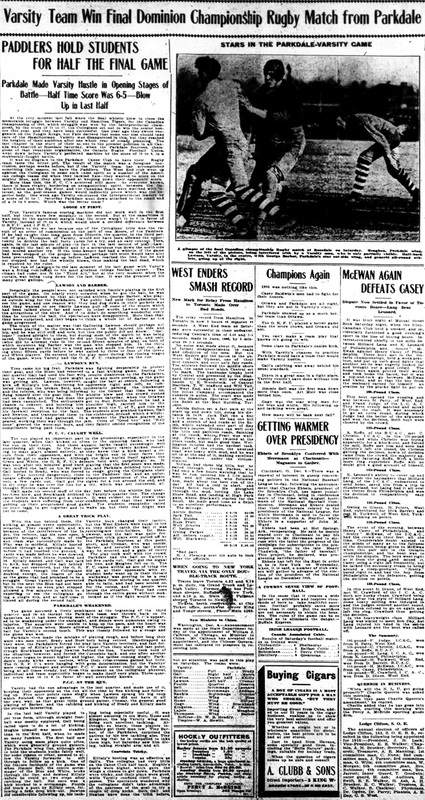 The most scandalous front page story involved allegations in a rival paper (likely the Star or the Telegram) that city aldermen had abused their free pass privileges at the Canadian National Exhibition and performers at the CNE Grandstand were blackmailed into purchasing clothing from fair officials. An investigation was launched by the city into a number of complaints instigated by disgruntled former employees of the fair, who claimed that one official allowed 30 to 40 friends in for free on a single day. The World’s reporter lashed out at the paper’s rivals, noting, “This sort of thing only gives outside newspapers to knock Toronto, and there is no sense and reason in it. Why do the evening newspapers try to stir up trouble so as to make it impossible for men to act on the exhibition board?” Alderman (and future mayor) Samuel McBride felt that gate staff had exercised proper strictness, noting that he had seen a director turned away for not wearing his badge. R. Simpson Building under construction, Richmond Street West, looking northeast, 1908. City of Toronto Archives, fonds 1244, item 7037. Take your stand on the corner of James and Queen [S]treets. Look southeast and you will see the magnificent new building of the Robert Simpson Co. Limited, a structure not yet fully completed, but beautiful in design and ornamentation, immense in size, and boldly suggesting not only a Greater Toronto, but also the Greater Canada to be. Now turn and look northwest, where stands the city hall, which, architecturally viewed, is one of the most beautiful and imposing municipal buildings on the continent, and of which the citizens of Toronto should be justly proud. We have used these reflections only because we learned from their coursings thru our mind that a duty lies on Toronto’s citizens positively to realize that to build as if the city was to have no future, no greater extent, and no larger place in the development of Canada, is to be untrue to both the municipality and to the Dominion. Physical expansion of the city was also in the news, as a hearing was announced for September 29 to listen to the town of East Toronto’s push to be annexed by Toronto. The town’s main reservation was that the proposed terms did not include the formation of a separate ward for the area, as West Toronto had received during its negotiations earlier in the year. The city’s board of control produced a report with “rather important recommendations” on hiring and salaries of civic employees. New qualifications for positions above junior clerk were laid out, which included an exam if applicants did not hold a junior matriculation certificate or were unable to prove that they were taking classes at the Toronto Normal School. Among the new recommended maximum annual salaries were $780 for a jail guard, $900 for a fireman, and $2,200 for a chief accountant. A meeting was held in North Toronto’s town hall to discuss the town’s overcrowded schools. The proposals put forward eventually led to the establishment of North Toronto Collegiate Institute and Bedford Park Public School. Federal Conservative leader Robert Borden announced his itinerary for a tour around the province, including a stop in Toronto on September 23. Officials of the Ontario Rugby Football Union gathered to celebrate its silver anniversary and organize its upcoming season. One of the first organized football leagues, the ORFU sent senior-level teams to the Grey Cup through the early 1950s. Photo of William Findlay Maclean, owner of Toronto World , c. 1909, from City of Toronto Archives, fonds 1244, Item 1296. All quotes from the September 19, 1908 edition of The Toronto World. Originally published on Torontoist on September 18, 2015. Part of the foundation pier from the 1831 St. Lawrence Market. The solution: starting that day, a public open market would operate every Saturday at the northwest corner of present-day Front and Jarvis. Nearly 30 years later, in 1831, the first permanent brick building opened on the site, a structure which ringed an open courtyard. Elements of that incarnation of north St. Lawrence Market, along with its successors, have been uncovered through archaeological work carried out as part of the preparations for the fifth market building to stand on the site. Model of the 1831 St. Lawrence Market, looking south from King Street, prepared by Ryerson students for the “Meeting Places: Toronto’s City Halls” exhibit at the Market Gallery in 1985. Beyond its role as a trading centre, the north end of the 1831 marketplace housed Toronto’s first city council chambers after the city’s incorporation in 1834. But the complex had its problems, especially for butchers: the height of the gallery exposed their meat to the sun; damp and poorly ventilated cellars also provided lousy storage. Space was so tight that farmers were turned away, forcing them to sell to grocers, causing a loss of civic revenue. Part of the balcony collapsed in July 1834 during a tax riot. The solution was the construction of a new south market building, which politicians and produce vendors moved into in 1845. St. Lawrence Market. North Market (1850-1904), Front Street East, north side, between Market & Jarvis Streets, showing east side, before alterations of 1898. Toronto Public Library. Bricks from the 1904 incarnation of the market. When the next version of the north market was completed in 1968, some tenants were happy to see the demise of the poorly aging 1904 building. “Gone was the dirt and dust,” the Telegram observed. “Gone was the roof which sometimes leaked. The cold and the gloom, the shabby walls and uneven floors had departed. Instead there is brightness under-floor heating and colour everywhere. The farmers have never had it so good.” Opening reviews were mixed, with architectural critics giving the space thumbs down for being too mundane. Dirt and dust is what you’ll find in the 1968 building as it awaits its end. Its placement atop a thin concrete pad made finding its earlier incarnations easier for archaeologists. Based on the three trenches made in the floor, you don’t have to dig deep to find the foundation piers from the 1831 complex. “Nobody had popped the lid to have a look at the what the preservation was like under the site,” archaeologist Dr. Peter Popkin noted during a media tour of the site on Wednesday. Part of the 1851 sewer system. Popkin and Golder Associates Ltd. conducted the current stage of the archaeological assessment over the past few weeks, and found elements of all pre-1968 structures within the trenches. Besides the original foundation piers, other uncovered features include the 1851 sewer system, and bricks, concrete foundations, and a box drain from 1904. Evidence points toward the existence of the cellars which irritated butchers during the 1830s. While items like animal bones and ceramics have been found, their volume is less than would be discovered at a residential site. The holes in the ground also show evidence of “robber trenches” where fill was dumped during each construction project, especially from 1904. Showing the different surfaces over time – the darker area is believed to be the outdoor courtyard surface of the 1831 market. One interesting find was the discolouration of levels of dirt, especially in the second trench. The darker stained soil was the original surface of the 1831 interior courtyard. While paving stones were contemplated, according to Popkin, visitors reported it was covered with gravel. The evidence points to a sandy material with plenty of pebbles sitting atop a clay capping. At the media tour, Deputy Mayor Pam McConnell (Ward 28, Toronto Centre-Rosedale) referred to the discoveries not as “surprises,” but as “prizes” which will help tell the story of the city from their respective eras. Up to 18 months of historical assessment work was built into the timeline for the new market structure, leaving plenty of time for further investigation and a mitigation study. It is expected that some of the material found will be displayed in the new building. It shall be seen how the discoveries affect plans for a 250-space underground parking lot. City of Toronto coat of arms, installed 1968. As it awaits the wrecking ball, the 1968 building feels like an archaeological relic. The tour provided one of the last opportunities to survey it, to notice touches easily overlooked on a busy Saturday morning like the old City coat of arms mounted above the stage. 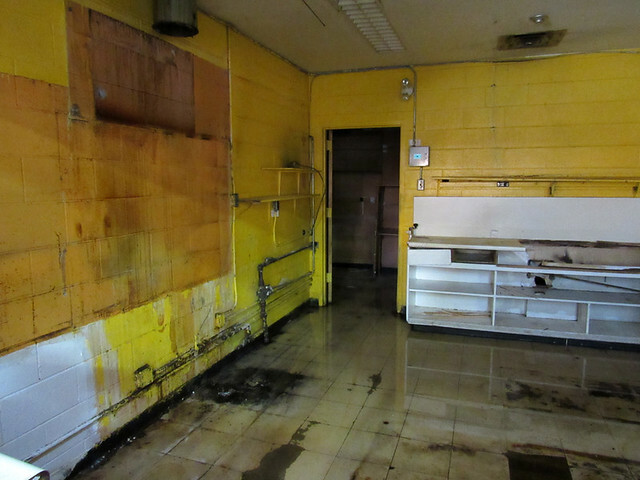 The waterlogged floor of the space which housed the snack bar. 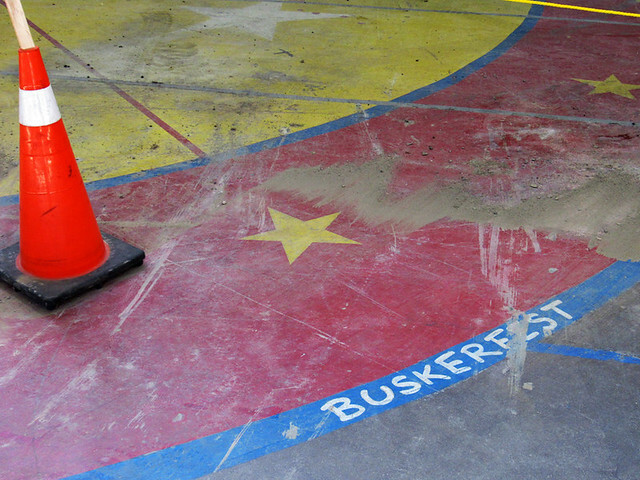 A floor painting honouring BuskerFest. The banner inviting visitors to check out the temporary farmers market to the south. Time will tell if this incarnation of the north market will be the least mourned. Additional material from the September 19, 1904 edition of the Toronto Star and the February 1, 1969 edition of the Telegram. St. Lawrence Market, north market (1850-1904), Front St. E., north side, between Market & Jarvis Sts. ; interior, main corridor, looking north, before alterations of 1898. Toronto Public Library. The construction of the 1904 incarnation of the north market was anything but a smooth process. Mind you, if you changed the few specific details, the following Star editorial could apply to many projects which go off the rails. Toronto Star, September 19, 1904. A few weeks later, the Globe offered further details on what was going wrong. The Globe, October 4, 1904. Looking north along Jarvis Street. The canopy connecting both sides of the market, installed with the new 1904 north market building, is visible. Photo taken October 26, 1904. City of Toronto Archives, Fonds 200, Series 376, File 4, Item 93. From the 1904 incarnation, we move on to pictures I took of the now-demolished 1968 version of the north market. 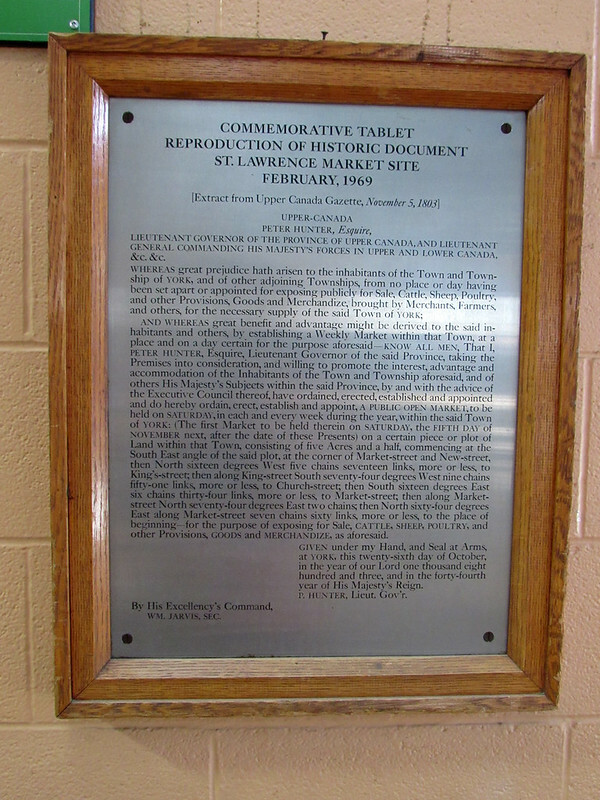 This plaque was installed to mark the official opening of the north side in February 1969. This was among the last ceremonial markers to mention Toronto’s Board of Control, which met for the last time later than year. Elected by the city at large, it was replaced by an executive committee chosen from incoming councillors. The 1969 incarnation included one former mayor (Lamport), one future interim mayor (Beavis), one unsuccessful candidate in that year’s mayoral race (Campbell), and one who never ran for mayor (Marks). 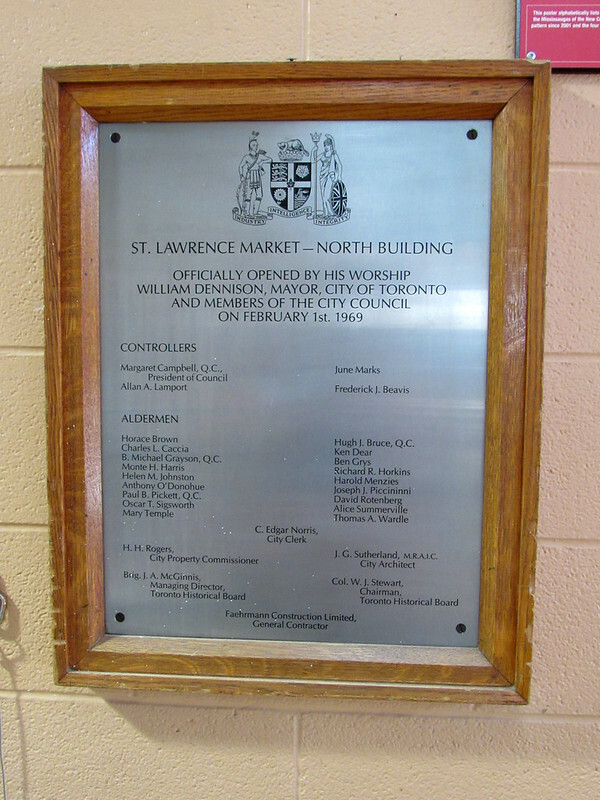 The neighbouring plaque honoured the establishment of St. Lawrence Market in 1803. 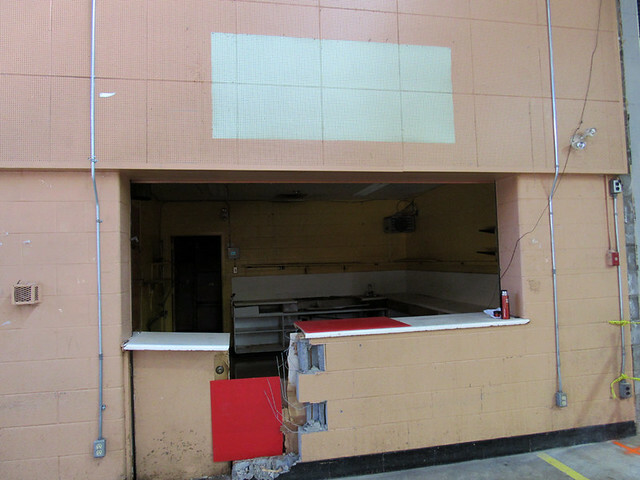 The shell of the snack bar looked a little worse for wear. I’ll admit that I never ate there (the temptations of Buster’s, Uno Mustachio, and Yianni’s filled my tummy on Saturday trips), but it’s nice to see that a positive, legit-looking review was left on Yelp. Upon closer inspection, wading boots may have been required to explore the snack bar’s remains. On the main floor, a painted tribute to Buskerfest remains, reflecting the event’s previous connection to the St. Lawrence neighbourhood.